The mental game may be more important in poker than in any other form of competition. It's one of the only games in the world where you can play perfectly and lose - again and again. Hundreds of poker players have turned to mental game coach Jared Tendler's revolutionary approach to help them play their best, no matter how badly they're running. In this audiobook you'll find simple, step-by-step instructions and proven techniques to permanently fix problems such as tilt, handling variance, emotional control, confidence, fear, and motivation. With the games getting tougher, now is the time to take these problems head on. Read stories from eight players who made major improvements using Jared's techniques. Get motivated with methods used by SuperNova Elites. If you could sum up The Mental Game of Poker in three words, what would they be? This is an extraordinary book for people who play poker regularly. 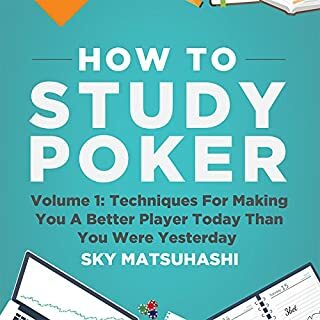 I will say that this is not the first book you should read about poker if you are just starting out. Jared only covers poker strategy peripherally and there are much better resources for learning the game. 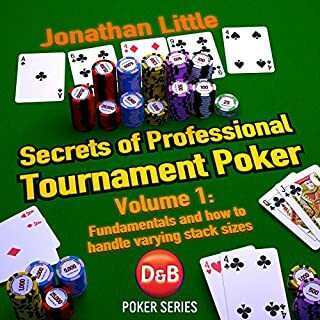 That being said, if you are someone who has studied the game a fair amount, someone who wants to play poker seriously and make some money or especially if you are someone who dreams of playing professionally this book is a must have. Just the sections on learning (concepts like the inchworm and the adult learning model) alone are worth the price of the book, but Jared goes much deeper into how these relate to common poker problems in later chapters. His in depth discussions about tilt, motivation, fear and confidence blew my mind. 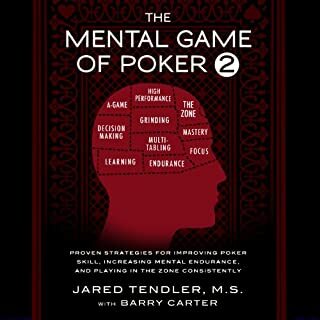 Instead of generally accepted poker wisdom which deals with treating the symptoms of emotion or striving to avoid emotion while playing (or avoid playing while emotional), Jared delves into finding the root causes of emotions and ultimately teaches players how to master their emotions and use them as a tool to get better at poker. As someone who has spent a lot of time trying to control my own tilt, and made a lot of progress at reducing it, I was deeply impressed and humbled to realize that a lot of it stems from unrealistic beliefs and expectations about the game of poker and the nature of variance. It is too early to say for sure that my emotions won`t get the better of me at the table again (and, in fact, I`m sure they will), but with the strategies and insights Jared has provided in this book I am confident that I will be able to recognize and better understand my emotional responses in the future. Ultimately the subject matter of this book extends far beyond poker. A lot of the mental hurdles faced while playing poker are the same ones faced in athletics, business, academics and even romance. Think of pressure to perform or the pain caused by a discordance between expectations and results as a couple of examples. One of my main interests is martial arts and especially the philosophies that guide developing martial artists. Jared never mentions this in his book, but a lot of the mental goals and strategies he describes are very similar to those found in the processes of ego death and transcendence of desire. These are lofty goals, and lifelong struggles, but Jared gives you all the tools needed to work hard at becoming a more zen like poker player and human being. What was one of the most memorable moments of The Mental Game of Poker? - Dusty Schmidt's analogy about weather and variance. - The Mental Game Fish and Mental Game Myths sections. .- The way Jared relates different mental game problems which I previously thought were separate. Who would you have cast as narrator instead of Jared Tendler? There are a lot of issues with the recording of this audiobook. Unlike some of the other reviewers I don't mind Jared as a narrator, but I did find his voice/pacing a little monotonous and slow. I actually listened to the majority of this audiobook on 1.5x playback speed and found it easy to follow. The really bad part of the narration for me was the client stories. I liked the stories, but the voice used for them was atrocious. It sounds like Jared used a computer generated voice to read back the stories. It's especially jarring when a female client's words are read in this voice. Side note, I actually know a few of the featured clients (by reputation, training videos and forum posts), and I think these stories are an essential part of relating the concepts to real life examples. Unlike the reviewer who described them as advertisements, I think they play an important role in the understanding of the material. Not only is it useful to hear the clients relate Jared's somewhat abstract strategies to concrete examples, it is also very useful to hear about people that have succeeded using these tactics. Because a lot of the concepts in this book fly in the face of conventional wisdom, and especially because a lot of the strategies/goals are lofty and will take a lot of consistent work, I think it is essential for players to have real life success examples so they are less likely to give up before achieving meaningful results. Another issue with the recording is the very nature of the book. It is not the type of material that eloquently transfers to audio. The book features a lot of lists, suggests a lot of cross-referencing and jumping around (much easier to do on paper than in an audiobook setting), and ultimately requires a lot of re-reading to fully digest. 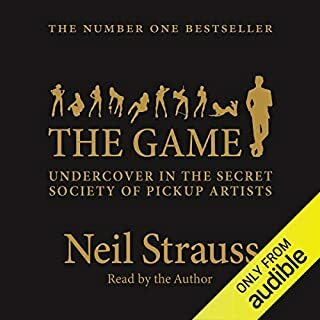 I have no regrets about purchasing the audiobook (in fact it's the best poker decision I've made in a long time), but I will be purchasing the actual book in the near future to make sure I get the most from the material. One last thing, I absolutely loved the brief sections narrated by the British guy. He concisely states a lot of complex ideas, and I might just be partial to accents, but his narration was a breath of fresh air. Yes. I sat down to listen to the first two chapters but got hooked. I ended up listening to this book all through cooking dinner, cleaning the kitchen and doing laundry. I woke up the next day and my first thought was listening to the rest of the book, although I had to complete some other tasks first. Now that I've finished I will be reviewing the sections one by one and working through some of the suggested assignments. It's definitely not a book that can be absorbed all at once, but I found the subject matter so compelling that I couldn't put it down. Now I'm looking forward to going back and studying certain sections one at a time. I'll be recommending this book to all of my poker playing friends (except maybe the ones I play against regularly). Definately recommend to all; even non-poker players. Great science-based insights for everyone who wants to be better at any activity and improve oneself at setting and accomplishing goals. 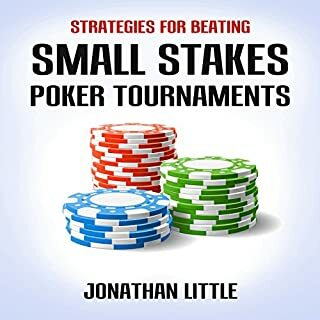 What other book might you compare The Mental Game of Poker to and why? 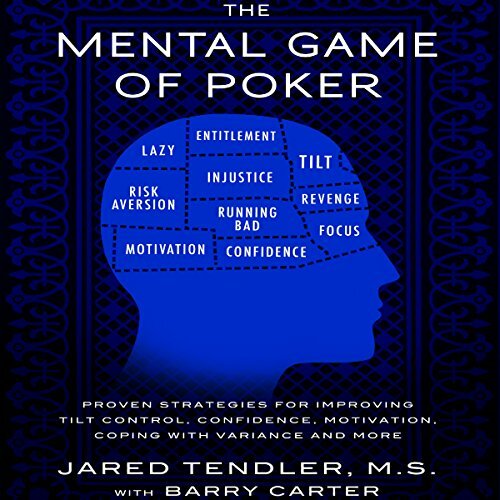 Jared's book and methods are to the mental side of poker what Doyle's Super Systew is to the strategy side of poker. Cadence was well metered but the alternate voice sounded mechanical and contrived. Should have used actual players or someone else's voice. No. Too much info for 1 sitting. Would you listen to The Mental Game of Poker again? Why? Yes, it touches on very important aspects of the game that otherwise go ignored by the average player. The way Jared teaches you to recognize and correct habits you may have to improve your game. Have you listened to any of Jared Tendler’s other performances before? How does this one compare? No, but I will be looking for other books after I get done listening to this one and repeat listening it a couple more times. Absolutely. It's not necessarily a complex set of instructions but definitely something to review and gauge your progress. Would you be willing to try another one of Jared Tendler’s performances? The performance of the book was a little rough. Not the best recording and Jared doesn't seem all that comfortable behind the Mic. That may be beneficial to the reader as it sounds like you're listening to a doctor talk to you. Yes, this book will definitevly help if you make an effort to practise what Jared want you to. I liked this book. Obviously it is written about Poker for Poker players, but I found the advice within can easily be applied to all aspects of life. I'm not a Poker player. I had flashbacks of the movie Rounders while listening to this because that movie taught me everything I know about Poker, which isn't a lot. There were terms in this book that I didnt know what they meant but I quickly caught on. I recommend you get this book as a hardcopy rather than an audiobook because there are worksheets and questionnaires to fill out. If you listen to/read this book in a day or two, it can be a little repetitive. One thing that really annoyed me with the audio was the echo, like he was too close to the microphone while reading. It wasnt there all the time, it comes and goes but its distracting. Overall, I liked the book and would recommend it. ...... which is basically garbage. Number one, Jared keeps referencing chapter 8 whenever he mentions a topic that is a hot topic of discussion. I got half way through chapter 8 yesterday and had to stop listening. There is nothing of value in this book for an amateur, and if you’re a semi-pro, you already know this stuff. In addition to this, Jared uses a lot of really superfluous words. He’s obviously trying to sound smart, and probably used MS Word’s thesaurus to sound fancy. It might work well in written word, but he has obvious difficulty reading his own book in the recording. This only mean one thing, Jared really doesn’t believe this stuff he wrote here. He’s bluffing the whole damn time. I actually did like *some* of the content in here, and I think Jared put a lot of hard work and effort into getting his thoughts onto paper. I honestly think someone else came through and edited it to a pulp, and since Jared isn’t a “real” author he just kinda went with it. This can honestly be written and performed in a way that more people in the general poker audience would enjoy it and understand it. I'm 5 chapters in and I can't take any more. The author doesn't speak in monotone, but he may as well. The content is great for SERIOUS poker players, but only if you can get through the way the author speaks. It's almost one great long run on sentence with chapter breaks. The content of this book is primarily boring, extraordinarily repetitious and too frequently self-referential. And that's the good news. The narration is terrible ... with Tendler failing to pause between the end of one section and the introduction or caption of the next, which made it difficult to follow his thoughts. The meaningful and useful content could have been covered in an hour or less. Excellent poker book, if I had to suggest one this would probably be it. 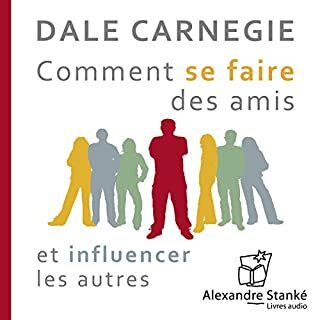 I really enjoyed the audiobook but I would suggest to have a written copy as well since it is kind of a go to manual that one should frequently consult.